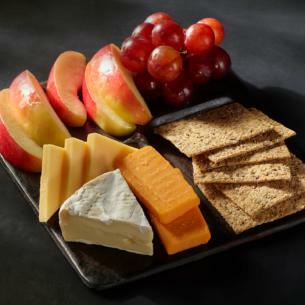 Brie, Gouda, two-year aged Cheddar cheeses, nine-grain crackers, apples and grapes make this the perfectly balanced box to enjoy any time of day. Now with more cheese, more fruit and 20 grams of protein. apples (apples, calcium ascorbate),grapes, brie cheese (pasteurized cow’s milk, cheese cultures, salt, enzymes), cheddar cheese (pasteurized milk, cheese culture, salt, enzymes, annatto [color]), gouda cheese (pasteurized milk, cheese culture, salt, enzymes, annatto [color]), cheddar cheese (pasteurized milk, cheese culture, salt, enzymes, annatto [color]), multigrain crackers (enriched wheat flour [flour, ascorbic acid, niacin, ferrous sulphate, thiamine mononitrate, riboflavin, folic acid], filtered water, stone ground whole-wheat flour, multigrain mix [cracked wheat, cracked rye, crushed flax seeds, millet meal, cracked triticale, barley grits, sunflower seeds, rolled oats, durum semolina], organic evaporated cane syrup, flax seeds [whole and crushed], durum semolina [semolina, niacin, ferrous sulphate, thiamine mononitrate, riboflavin, folic acid], wheat bran, sunflower seeds, sunflower oil, cracked rye, sea salt, millet).